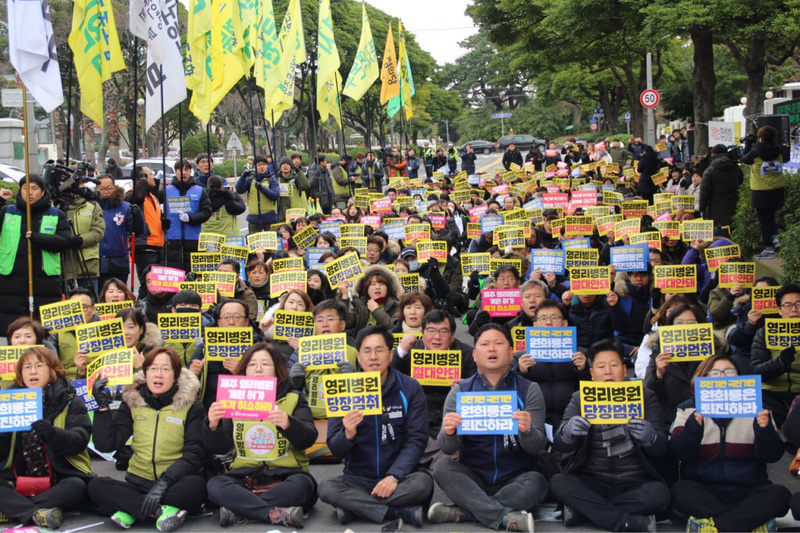 KHMU Info - The KHMU will actively conduct the struggles against establishment of the for-profit hospital in Jeju throughout the year 2019. 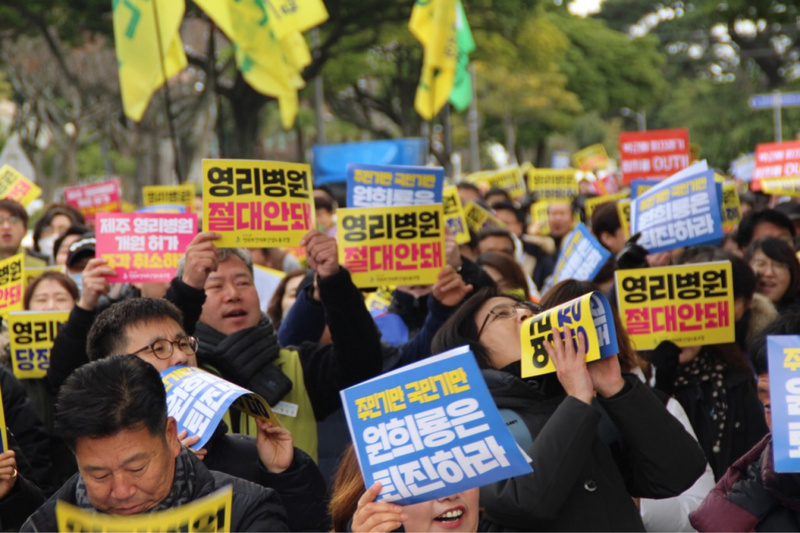 The KHMU and the civil society jointly held a rally to urge the Governor Won Hee-ryong of the Jeju province to retract the approval for for-profit hospital and to step down from the governors’ position. The rally was joined by around 500 workers and civil society members, including approximately 300 branch heads and leadership of the KHMU from across the nation. Protesters denounced the provincial government for Governor Won’s breaking his word and ignoring the popular will by approving the establishment of the for-profit hospital, which will bring dishonor to history. In addition, they pointed out that the current central government is also responsible for this issue. The President Moon promised during the election campaign that he would prohibit for-profit hospitals from being established and protect the health and medical sector from the attempt to privatize. However, till today, he has not intervened at all in Jeju’s decision to approve the for-profit hospital. The KHMU President Na Soon-ja stated, “The year 2019 will be recorded as a year for struggles to let a single for-profit hospital NOT be established in this land.” Right after the end of the rally, the protesters attempted to get into the governor’s office, clamoring to see Governor Won. Sit-in protest and march were also followed. Meanwhile, the KHMU held the union retreat for core leadership members to discuss major struggle and campaign plans against for-profit hospitals and about the healthcare personnel law to be enacted. They will also continue to discuss the anti-for-profit hospital struggle plans at the branch heads’ retreat to take place on January 22 and 23, including the one million signature campaign. 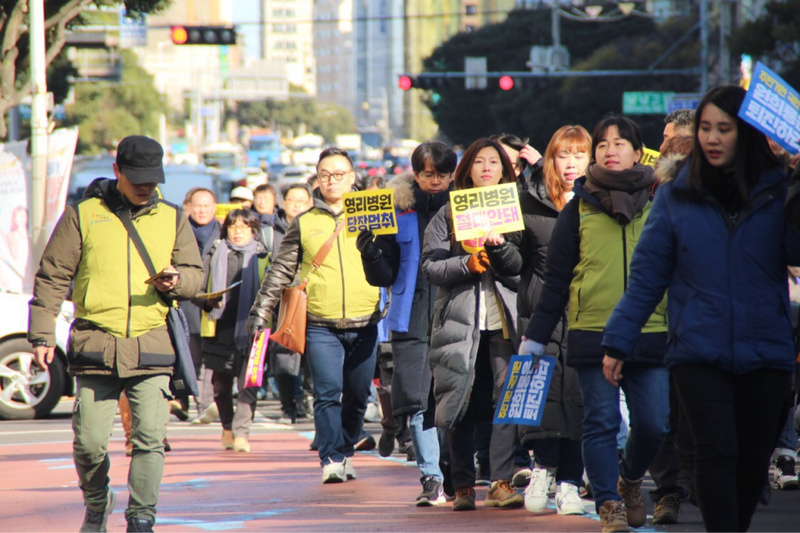 They decided to hold a protest before the Blue House on January 28. No for-profit hospital is seen in Korea at the moment. Until today, the civil society has strongly opposed any types of for-profit hospitals. Considering that public hospitals represent only 10% of the entire medical institutions, any for-profit hospitals, once they are introduced, will break down the current national health insurance system and medical cost will surge. In 2014, the KHMU staged general strikes three times and collected around 2 million signatures in collaboration with the civil society. 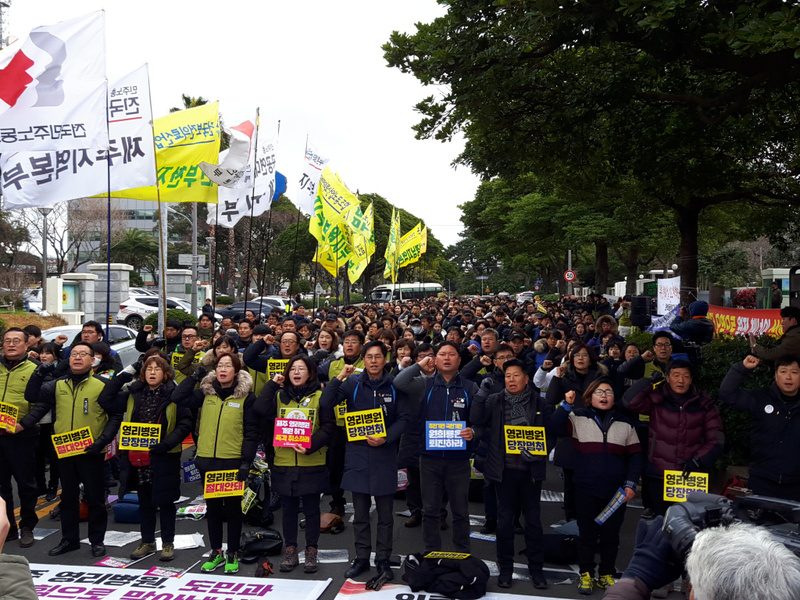 Nonetheless, the past conservative administration amended the medical service law into the direction to permit for-profit hospitals provided that the hospitals are run in the free economic zone including the Jeju province. In December 2015, the Ministry of Health and Welfare approved a business plan turned in by the Green Land Jeju Healthcare Town Ltd.(GJT), which is Green Land Group’s subsidiary. GJT invested a total of 77.8 billion KRW in the healthcare resort project and laid the groundwork in July last year. However, approval for the for-profit hospital remains as a hot button. Governor Won promised to follow his citizens’ will and launched a public opinion survey committee with 200 residents. The committee ran discussion sessions from March to October and its final report stated that around 58.9% of the residents went against for-profit hospitals. Governor Won ignored the result and conditionally permitted the profit-seeking international green land hospital on December 5, 2018. He put an emphasis on the trust with international business entities to attract more foreign capital and mentioned a possibility for them to be sued for a huge amount of compensation. He said that the conditional approval was the only choice to avoid. The conditionality refers to the conditions that the hospital offers its service to non-Korean patients only and starts operation within three months. Meanwhile, the international green land hospital insists that they can’t make profits out of foreigners only, hence they need to see Korean patients as well. For this, the KHMU also raised an issue of possibly illegal elements in going through the approval procedures, as the Green Land Group is just a real estate investment company, not a medical service provider that have experiences of managing hospitals. Accordingly, the approval should and can be recanted. The for-profit hospital was reported to have 47 sickbeds and offer the services in plastic surgery, dermatology, internal medicine and family medicine. It has employed 9 medical doctors, 31 nurses and 33 coordinators, totaling at 134 employees, which includes 107 local residents. However, its actual size is a lot larger than reported, to an extent to which it can accommodate as many as hundreds of sickbeds. To establish a for-profit hospital, the entity should acquire permission of its business plans first from the Ministry of Health and Welfare and, second, from Health and Medical Policy Deliberation Committee in Jeju, followed by the Governor of the Jeju province.